Sceduled Gardening maintenance, Lawn mowing. Gardening services. Maintainin­g gardens to keep a good curb appeal in your area. Honest, reliable, with no criminal or driving conviction­s. Regular Lawn mowing, line trimming, edging, hand weeding of vegetable patches & flower beds. Pruning, trimming trees. Hedge pruning . Planting. Covering East Auckland. Howick, Pakuranga, Remuera, Botany, East Tamaki, Whitford, Herne bay, Ponsonby, Grey Lynne, unable to travel elsewhere. Regular gardening and lawn mowing ONLY. From just weeding to hedge trimming to full maintenanc­e services. NOT available for one off work at present. This is a REGULAR SCEDULED MAINTENANCE, gardening and lawnmowing business, catering for regular contract residential and commercial clients. I have a large portfolio of regular clients, from mowing fortnightly to full gardening service with hedge trimming debris cleared and taken, with seasonal fertiliser spreading. Lawn mowing. I can maintain a flats garden to a quarter acre to a lifestyle block of many acres. I have all necessary top of the range 4 stroke garden power tools, plus Ryobi Plus one battery power tools, lawnmowers for dedicated mulched lawns. I have ride mowing experience. General Gardening charged at time taken to complete job at minimum of $40 an hour plus additional cost of materials if required and debris removal. And additional services, i.e. spraying, fertiliser. Local Lawn mowing starting at $25 per small lawn, lawns charged at $40 per hour if time taken is more than an hour for overgrown or larger properties. Average size lawn (Regular) $30-40. See photos. Photo 2, Fortnightly maintained, mowing weeding and planting seasonal. Mulching. Photo 3, New weed mat, bark, and shaping shrubs, maintained monthly for past 3 years. Photo 4, Shaping ornamental small trees. Photo 5, Garden design with landscape products, stones, bark edges and planter box and pots and planting. One off, for a wedding. Photo 6, hedges, spraying, industrial premise. Photo 7, Hedges twice a year, Lawns and debris fortnightly. Thanks Tim for delivering high quality service and going the extra mile to get the job done. It was nice meeting you. We'll definitely make use of your services again and would highly recommend you to anyone! A++ Trade, fast clean and tidy, Highly recommended. Tim: My pleasure, one of those jobs that I enjoyed doing and thanks for being a good customer. 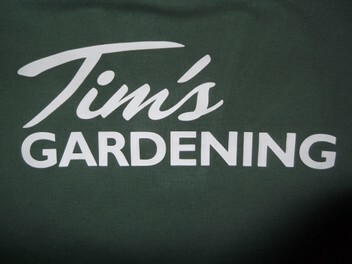 Tim: Always happy to do your gardening at your property. My pleasure. Thanks from Tim. Tim: Pleased to help. Regards from Tim. Excellent service, honest, reliable and hard working. His work was good value for money. Did all the jobs we asked and tidied up at the end. Garden looks immaculate. Thanks Tim. Tim: Your garden being so large is always a big task. Always hear to help. Regards from Tim.